Ruthiebear (Titusville, NJ, United States) on 1 July 2014 in Lifestyle & Culture. The colours and lights are super. 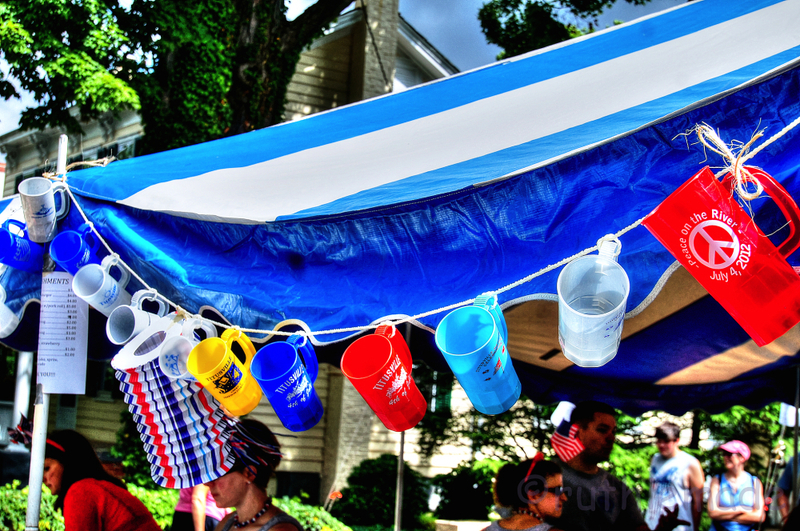 The cups are very suitable to decorate the awning. Well seen, a very nice and colorful "HST" photo as result. Its quite cool really. Definitely unique. A beautiful colorful view for ST, it's very funny. Have a good day, happy ST.
Well spotted - a very STriking decoration! Superb framing and colors . Happy ST ! Colourful and vital. I like it! Beautiful colourful shot! Nicely spotted! A bright, colorful summer decoration. I like the idea of showing cups this way. Interesting framing, nice colors, great capture. Quelles tasses pendues et vue superbe couleur très original. Une photo très originale, haute en couleurs. An interesting way to turn this into a colorful and festive awning! Great capture!! The fine-looking and colorful tent! :-)))) Haleja. Happy July, my good friend! I like the "Peace on the River" cup. Cool shot. Wow, bright and happy looking party. They certainly make a nice decoration! Beautiful light and color! Happy ST! They certainly make interesting decorations. Nicely shot, Ruthie. You always find some interesting shot. Like it. A very nice collection of July 4th cups -- great find! Excellent !! I love it !! Great colors !! !